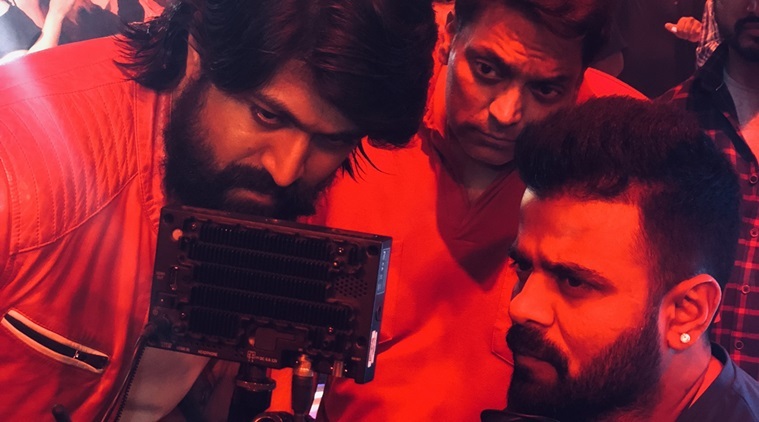 KGF cinematographer Bhuvan Gowda discusses his partnership with director Prashanth Neel and what to expect in the second part of KGF. Bhuvan Gowda says every shot of KGF was a challenge for him. Bhuvan Gowda has become one of the most-sought after cinematographers in the country, thanks to KGF. The blockbuster has put Kannada cinema on the map in terms of making large-scale movies. Touted to be the most expensive Kannada film to date, it created new records when it opened on December 21 in multiple languages. One of the highlights of KGF was its technical superiority. And Bhuvan’s contribution to making the film a visual spectacle was huge. In an exclusive conversation with indianexpress.com, Bhuvan discussed his partnership with director Prashanth Neel, the challenges of shooting part 1 of KGF and what to expect in the second part. Q. Tell us about your experience of shooting KGF. Director Prashanth Neel is the main pillar of this project. I was working as a still photographer for Prashanth’s Ugram. Due to some reasons, the cinematographer of the movie quit and then the director asked if I can take over the job. I was hesitant as I told him that I did not have any prior experience of shooting a film, especially such a big budget film. He convinced me to do it. I shot Ugram with a 5D camera. The director loved my work. He offered me KGF also. This was the biggest film of my life and so I took extra care while planning the shoot. We storyboarded everything before going to the shoot. And in fact, I oversaw set design to ensure everything went according to the plan. Q. How did you achieve the visual style of KGF? I used a lens called master prime. It keeps the focus only on the main subject and blurs out the rest. And lighting was a major part of achieving the visual style that we wanted for the film. Because of that we were able to make this film so beautiful. I never used artificial lighting while shooting outdoors as I wanted to play with the light and shadow. We wanted to give scenes a dark contrast. I also did some experiments in this movie. I shot on low exposures and didn’t use lighting for outdoor shoot. Even for night episodes, we avoided artificial lights and shot the sequences sourcing the light from actual fire. Given that we were shooting on massive sets, to light up the entire area, we sometimes set fire to the huts on the location. Q. What were the challenges you faced while shooting for KGF? Every shot of KGF was a challenge to me. Especially, the climax scene involving the procession and the song in which a mentally-stressed character tells a story were difficult parts for me to shoot. Lighting the whole set with real fire was a major challenge. I shot the movie majorly with the camera mounted on my shoulder. That’s why about 40 percent of the film feels shaky. Thanks to Prashanth’s faith in me, I was able to do such experiments. Q. Post the release of KGF, what is the response you are getting from the industry? I have been getting a lot of compliments for my work in the film. Usually, technicians don’t get their due recognition or such appreciation for their work in films. It’s a rarity because either the hero or the director stay in the spotlight. Every member in the technical crew worked without any expectation. But, after the release, the technical team has been garnering a lot of appreciation. I am very happy. Q. How is KGF: Chapter 2 going to be visually? It is going to be amazing and on par with Hollywood movies. The response for Chapter 1 exceeded our expectations. Now, meeting the expectations of Chapter 2 is a real challenge. It has become really tough for us. We have shot a few connectivity shots while making the first part. 95 percent of filming is still pending.